My Crock Pot Is The Best Friend I Have… In the Kitchen! I just made a big crock pot of barbequed pulled pork for sandwiches. It was awesome to mix it up a little. I mean the everyday meat and cheese sandwiches get a bit boring. I even put a quart size bag in the freezer for later when I am just too tired to cook. Well not everyone wants pork every week. I know I don’t! So finding this chicken that was super functional was awesome. Especially since it can be used on salad, in burritos, or just served with rice and beans. And being able to serve this on a bed of lettuce is great. I love making salads for lunch. But I love being able to make several for the week ahead. I put some dressing in the bottom of a mason jar, then a layer of chicken, some garbanzo beans, lettuce, then put the lid on. When I am ready for lunch I open the jar and turn it upside down on a plate. 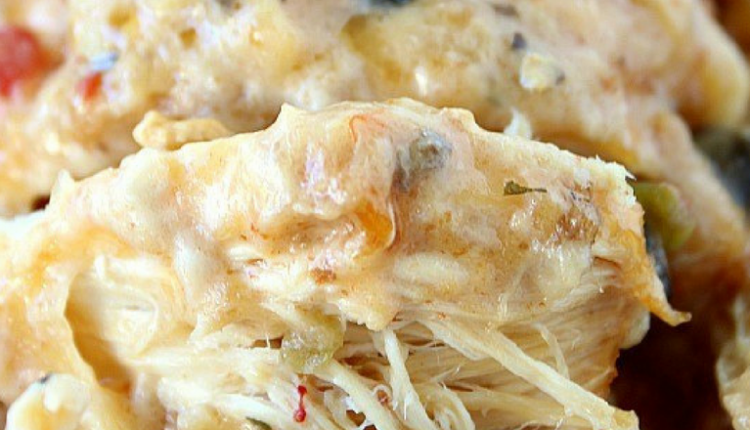 This crock pot cheesy chicken would be great served over a bed of rice too. Also, stuffed into a flour tortilla to make a delicious tasting burrito would be tasty. I know what we are having for dinner tonight. Yum! GO TO THE NEXT PAGE FOR THE INGREDIENTS AND DIRECTIONS. Quick Tip: If you want to add some kick to this recipe go ahead and add a can of diced green chillies. Yumm. If You Think Getting Dinner on The Table Is a Chore, Think Again.